Watching How to Train Your Dragon: The Hidden World, I was reminded of another animated trilogy capper: Toy Story 3. Both are animated series that basically aged with their audiences. If you started watching these movies when you were a kid, you’re at a very different point in your life watching the third installment, and both movies are kind of about putting childish things away. For Toy Story, it was about moving on from your childhood toys, and for How to Train Your Dragon, it’s about moving on from your childhood pets. Dragon has a difficult time because it’s not always sure what it wants the dragons to represent—a domesticated species or a race that’s equal to humans—but The Hidden World manages to keep its focus by making its story about Hiccup’s journey to a leader who has to make the tough choices in order to protect both his people and the dragons. 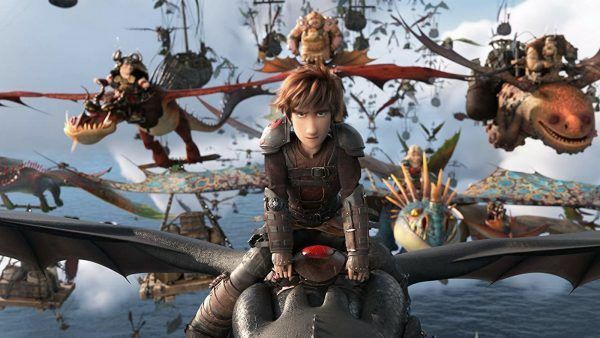 Picking up a year after the events of How to Train Your Dragon 2, Hiccup (Jay Baruchel) is now the leader of Berk following the death of his father Stoick (Gerard Butler), and he’s made it his mission to rescue dragons and resettle them on his small island. Unfortunately, the island can’t really accommodate all the dragons, and even if it could, they’re still a target for all the dragon hunters in the world. Hiccup resolves to find “The Hidden World” his father told him about when he was a boy, believing it to be a sanctuary where his people and the dragons can live in peace. However, his plans are complicated by the arrival of the Night Fury hunter Grimmel (F. Murray Abraham), who wants to kill Toothless, and employs the last Light Fury to try and break up the friendship between Toothless and Hiccup. The Hidden World feels more epic in scope than the last two Dragon movies even if its stakes are more intimate. Even though the film spans new horizons, features a formidable villain, and takes viewers to the lush and luminescent Hidden World, the story is really about the end of Hiccup and Toothless’ journey together and what that ending means for both of them. Some may see this as a lesson in the impossiblity of coexistence, and that ultimately the antagonists who said that humans and dragons couldn’t live in peace were right. But it’s clear that the movie is really about what hard choices have to be made in the name of peace. This is where the muddled metaphor of the dragons becomes a serious obstacle to the themes of the film because in some scenes, dragons are supposed to be equals with humans. When Grimmel rails against dragons, he treats them as inferior and as “thieves” and “killers”, thus conflating his prejudice with the bigotry of those who also lack familiarity with another group. But in other scenes, the dragons are just unique pets. They’ve been domesticated, so they serve the humans, and in this reading, the movie is on firmer ground because Hiccup isn’t saying goodbye to a group that’s equal to humans, but a group he’s used as an emotional crutch and a way to avoid what’s best for everyone. The conclusion will certainly rub some people the wrong way just as I’m sure there were those who didn’t want Andy to ever give up his toys in Toy Story 3, but I like the notion of sacrifice at the center of Hiccup’s story. Sometimes there’s a gulf between what we want and what we need, and trying to reconcile those two is a selfish desire. While perhaps there’s a different movie about the importance of co-existence, that’s not really the story that director Dean DeBlois set out to tell here, and it’s also one that probably wouldn’t give the trilogy the resolution is needs. If the story is “Hiccup found a way for Berkians and dragons to co-exist happily ever after,” then he’s really just in the same place he was at the end of the first movie when he was kid. In that telling, he hasn’t grown as a person. DeBlois made a smarter choice and while it gives The Hidden World a bittersweet flavor, it’s a much stronger story as a result. Unlike How to Train Your Dragon 2, which at times seemed like it was struggling to settle on its themes, The Hidden World feels like a far more cohesive picture with richer visuals and a grander scope while still retaining the warmth and humor of the previous installments. 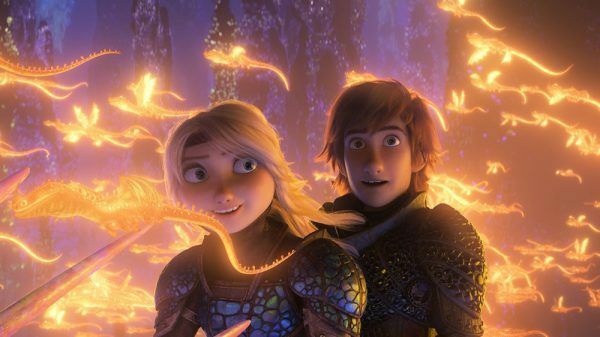 While the How to Train Your Dragon trilogy has been one of the unexpected joys of the 2010s, especially coming from DreamWorks Animation, the story has gone out on a high note where hard choices are put above personal fulfillment and the cost of saying goodbye has a real impact. It’s a fond farewell.